The Christian Wife Life: the weekend, soreness, and David Thompson. I hope you had a fabulous weekend. I sure did. Friday I had my big group fitness certification day at IFTA's Raleigh Fitness Weekend. I was nervous, but I think it went pretty well. I was definitely glad that I studied for that test. Saturday I took a "Dance Evolution" class and a "Glee Goes Group" class with Petra Kolber and she is AWESOME. If and when I teach group fitness classes, I want to be like her. Energetic, encouraging, always smiling, funny - everything that made me feel great and believe that I could do it. I seriously could take her class every day. I might order some of her videos. She's from England so she has a cool accent too. They were dance fitness classes which means they were my kind of classes. I love dance, so incorporating it into fitness is perfect workout motivation for me. Even though I've never watched Glee, (I know, I know, I would love it, I just can't commit) it was so cool working out and dancing to a medley of Glee songs. Very fun. I also took a Zumba class which was fun as well, especially because I was beside the cutest old lady. She cracked me up. And then Sunday I took another one of Petra's classes and fell in love. It's called Batuka. Remember that, because it JUST came to the United States and I have a feeling it's gonna be big. It's kinda almost like Zumba, but better in my opinion. I'll tell you more about it at a later time because guess what.....I'll be getting certified to become a Batuka instructor next month! Yeeeauuhhh. I was going to get Zumba certified but changed my mind. I cannot wait. :) :) :) :) Okay that was smiley face overload but I care not. On Sunday I also took a choreography construction class and a beginner instructor class. So as you can imagine, after all these classes and working out, I am wore slam out. Yesterday my legs hurt so badly...the worst was sitting down and standing up oh my word. I dreaded visits to the bathroom. I felt like such a wimp. But I like being sore because I know I got a really good workout! And it motivates me to work out even more! I'm so thankful that I got to participate this past weekend. I highly recommend it for anyone interested in fitness whatsoever. Saturday night we went to the NC State vs. South Alabama football game. South Alabama had never lost a game. They are a pretty new team (I think they were 19-0 or something) but that is impressive to start out so well. It was rainy...actually not rainy, it was MISTY the entire time. Like you can't tell if it's really raining but then you touch your hair and it's pretty wet and you're like oh it's raining. That kinda misty. But it was so fun. We won (go Pack!) and it was excellent time spent with my husband and my new best friend. Who's my new best friend you may ask. Oh I'm just referring to my pal Dave. You may know him as David Thompson. Jordan and I were finding out seats when Jordan was like Hey! There's David Thompson! And I was like whaaaat and then he was all Hey! He's on our row! And I was all whaaaat and he was like Hey! Our seats are right beside him! And then I got all giggly and nervous. But he was super nice and talked to us the whole time and told us some cool stories and it was SO AWESOMEEE! My mom told me to ask him over for dinner but I refrained. We had such a fun time and became best friends. If you don't know who David Thompson is, you need to change that immediately because he is the man. He is Michael Jordan's role model if that tells you anything. I'll let you read about him on Wikipedia if you actually don't know who he is. Well I'm gonna go figure out what's for dinner. Have a great rest of your Monday, people! Oh my goodness! David Thompson came to my school when I was a senior! We got a group picture with him of everyone who was going to NC State doing the wolf sign! That is so cool you got to sit with him for a game! I am still a little jealous but thrilled for you to get to meet #44. Just remember, I met him first. :) Love your enthusiasm about getting certified and teaching classes. You may have found your calling....teaching+working out+helping others. You go girl! How cute are you?!? Sounds like a fun weekend! We have lots of friends who are State fans and some were at the game as well. 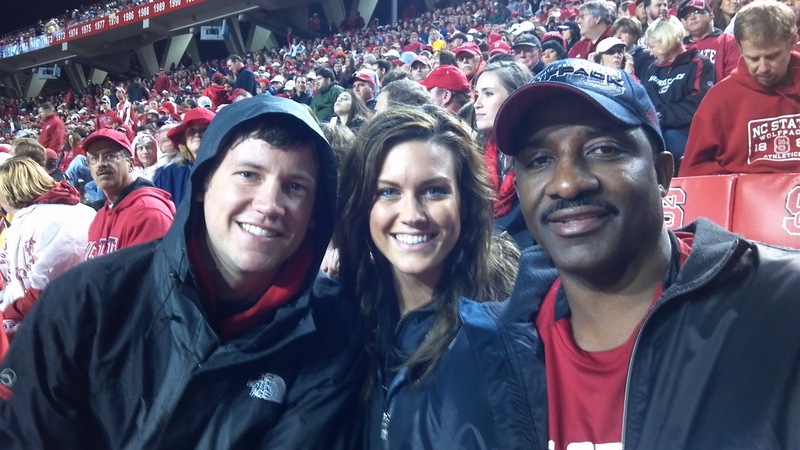 I know one would have loved to have been sitting on your row with David Thompson....how cool!